Do you find yourself putting more of your body weight on your ‘good’ knee? Does your ‘bad’ knee feel unstable? Have you experienced sharp pain, or does your knee area feel warm and swollen? Or maybe you feel like your knee is seizing up? Whatever your knee problem, it’s important to get the right diagnosis and treatment, so you can improve the quality of your life and get back to what you enjoy doing the most. Our knees take a lot over the course of our lifetime, especially active ones. They bear our full weight when standing and absorb extra impact when we run, jump or play sports such as tennis, football or netball. When our knees are working, they help make life easier by managing our busy and active daily schedule, but it’s not until there is a problem that we understand how limiting knee pain can be. Even walking up and down the stairs, getting in and out of a car, or taking a leisurely stroll can become difficult. Many people believe their knee problems are down to age-related wear and tear, and they put up with pain and stiffness because they think it’s a natural sign of getting older. While knee conditions become more common the older we get, knee pain is treatable and is not a sign of your age. No one should have to suffer with knee problems; they can affect your lifestyle and leave you feeling helpless or like your only options are to grin and bear it, rest or pop pills. You don’t have to feel this way; we’re here to help you. We combine several therapy techniques to improve your knee health. Our goal is to get to the root of the problem and provide you with a long-term solution to end your knee pain. We’ve treated many different types of knee conditions in Market Harborough, and have helped our clients return to the activities they enjoy, whether that’s running, skiing, or simply walking without pain. We treat long-standing, ongoing pain as well as injury or pain that has just come on. It’s important to act as quickly as you can to aid your recovery. 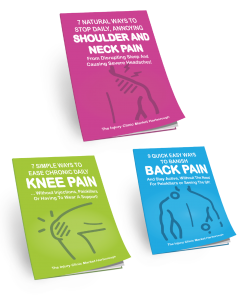 If you’re looking for an alternative solution to living with pain, then our practitioners will provide you with a complete treatment approach that’s focused on a range of therapy and exercise techniques derived from physiotherapy, osteopathy and sports therapy, giving you a long-term solution that will help you live pain-free, stay mobile and enjoy life. Whatever your knee pain, we’re here to help. "To be able to get back to proper training, classes and general day to day duties without pain and discomfort means so much. I am grateful to have been in the very best hands! Thank you! When knee pain stops you from doing the things you love, it’s time to take action. If you can say yes to any of the above then our knee treatment service is right for you. When knee pain stops you from doing the things you love, whether it’s keeping up with the kids, walking the dog, playing golf or running a marathon, it’s time to take action. 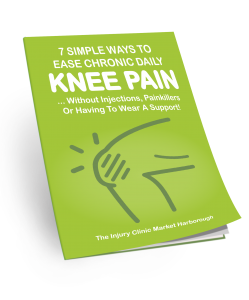 7 Simple Ways To Ease Chronic Daily Knee Pain! …Without Injections, Painkillers, or Having To Wear A Support! At The Injury Clinic Market Harborough we treat people of all ages for a wide range of both recent and longstanding injuries. Whether you’ve sustained an injury during sport or exercise or have aches and pains accumulated from work and a busy lifestyle; we have the treatment solutions to help you live pain free, move easier and return to the activities that you enjoy. To be able to get back to proper training, classes and general day to day duties without pain and discomfort means so much ... I am grateful to have been in the very best hands! Thank you! I was in a great deal of pain with my back. At The Injury Clinic they sorted my pain over several sessions with massage, acupuncture and good advice. Extremely professional and friendly and I would not hesitate in recommending them to anyone who is suffering with pain! I would highly recommend Chris and The Injury Clinic. Chris is very knowledgable, professional and friendly. I see Chris on a regular basis for the damage I do to myself and he never fails to make me feel better by the time I leave my appointment.